PLEASE SIGN THIS BRAND NEW PETITION I JUST MADE, THIS IS MY SECOND PETITION. Signed and shared in FB groups, thanks Sue. Noted and signed, thank you Sue and Deb for the forward. Noted, signed and shared! Thank you, Sue! Signed and noted. Thank you Sue, and thank you Deb for forwarding! Constance, You signed on July 5, 2013. Thanks Sue, noted and sure signed! Fran, You signed on July 5, 2013. Signed, shared and noted. TY, Sue! Signed and noted. Good petition. Well written! Signed without the slightest hesitation. Thank you Sue! Sign with pleasure will promote it among friends on care2 and f/b. Signed, thank you Charles for the forward. Signed # 417 & Noted & Thanks for posting Sue. Noted and it changed from 79 to 80. Love ya, Sue!!!! Noted, tweeted, shared, tweeted, shared and signed. Laurie, You signed on July 6, 2013. Signed pronto for the ferrets! Great job, Sue! Dee, You signed on July 7, 2013. SIGNED AT # 674, OUT OF # 2,000 NEEDED IN TOTAL ! Lisa, You signed on July 7, 2013. U.S. fish and wildlife service, the Govenor's of the following States: New Mexico, South Dakota, Wyoming, Montana, Arizona, Utah, Kansas Thanks Sue! Noted, Signed & Shared. Thanks Sue. Oops, Sorry thanks Sue and Deb. OOOOH, IT'S AT # 828, NOW ! U NEVER KNOW, ; IF U DON'T TRY ! Signed and shared. Thank you Sue and thanks, Deb, for forwarding. Noted and signed with thanks Sue, and to Deb for forwarding. Signed Sue, thanks. Thanks also to my friend Deb for shairng. WHY does man have to poison these 2 beautiful creatures????? They are not bothering anyone or anything! Signed and noted! thank you everyone for signing this petition and noting this story, the black footed ferret is the most endangered mammal in the usa. Noted, signed and tweeted, thanks Sue. Thanks Sue and thanks Philip for forwarding -signed. Save a species on the brink of extinction. 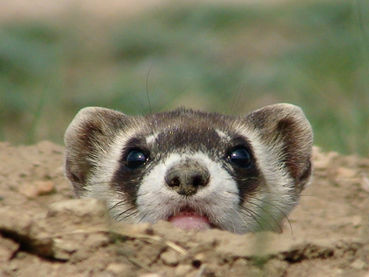 Black-footed ferrets Petition. Thanks Sue. Sorry I am tardy Sue...#975 S&N and a TU for Deb "S" for sending this to me to sign! Signed and noted. Thank you - it would be a shame to lose these adorable animals a second time.